Dr Cameron Grant, University of Adelaide, South Australia and Emeritus Professor Pieter Groenevelt, University of Guelph, Canada will deliver this joint seminar entitled "Plant available water: What must happen to make its accurate prediction more than just a Clayton’s dream?". Scottish barley yields are down this year despite there being no shortage of soil water – in fact, the excessive soil water probably contributed to the lower yields. By contrast, Glyn Bengough and colleagues have recently shown that many Scottish soils are so hard that plant roots struggle to penetrate them to extract water and nutrients. In the sandy, drought-stricken soils of central North America, maize yields have been disastrous this year, particularly on the sandier soils, where evaporative demand has outstripped the ability of the soil to transport water to root surfaces through the growing season. Furthermore, many crops around the world grow on soils that experience multiple physical limitations such as salinity, waterlogging, compaction, hardness, and low hydraulic conductivity – some of these limitations also interact to reduce plant water extraction. To accurately predict crop yield potential based on soil water requires us to integrate the limiting soil factors for different plants under different soil and environmental conditions. The ultimate model for this purpose, however, has been elusive to date and scientists might well ask whether seeking such a model is simply another Clayton’s dream (i.e. the dream that will never eventuate). 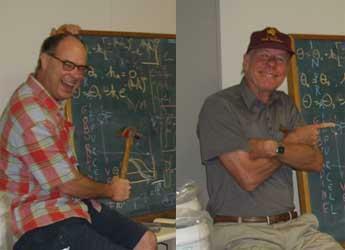 Pieter Groenevelt and Cameron Grant have worked together over a period of 30 years on several applied problems in soil physics. In their seminar, they will present ideas to help integrate the soil and plant factors that dictate plant available water and they will seek your advice on the best plant-response factors for evaluating their models.